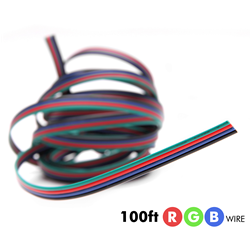 LED RGB 24 Gauge Wire - Four Conductor RGB Power Wire. Use for connecting and lengthening segments of RGB LED. Strip lights can be connected at length with by using this 24 AWG wire. Attach the wire to a solder-less connector, signal amplifier, or remote control when needed. Required items for operation: Shrink wrap tubing (for sealing soldered connections).Solder and soldering iron. We do not recommend wire nuts or electrical tape be used for connections.